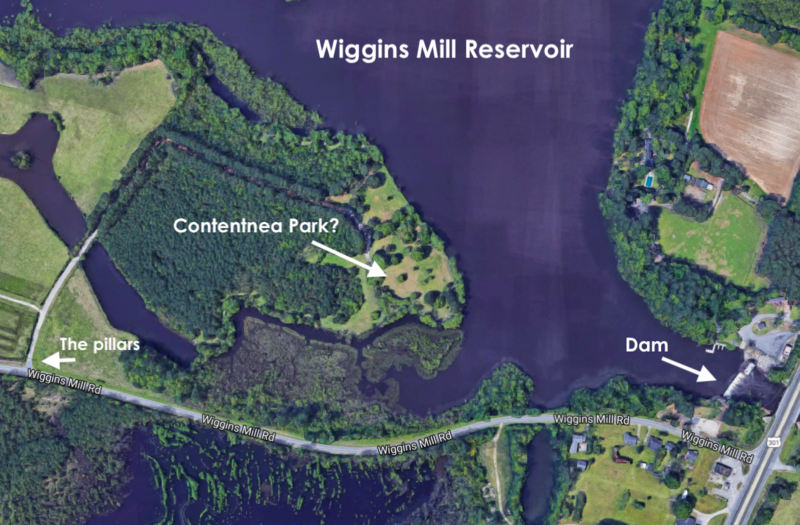 The first drowning at Contentnea Park. Wilson Daily Times, 22 July 1924. Eddie Simms — in the 1920 census of Wilson, Wilson County: on Manchester Street, tobacco factory worker Frances Simms, 34, and children Milton, 22, Eddie, 18, Raymond, 10, Maggie, 8, Ava, 5, Richard, 2, and Bay, 3 months. Eddie B. Simms died 17 July 1924. 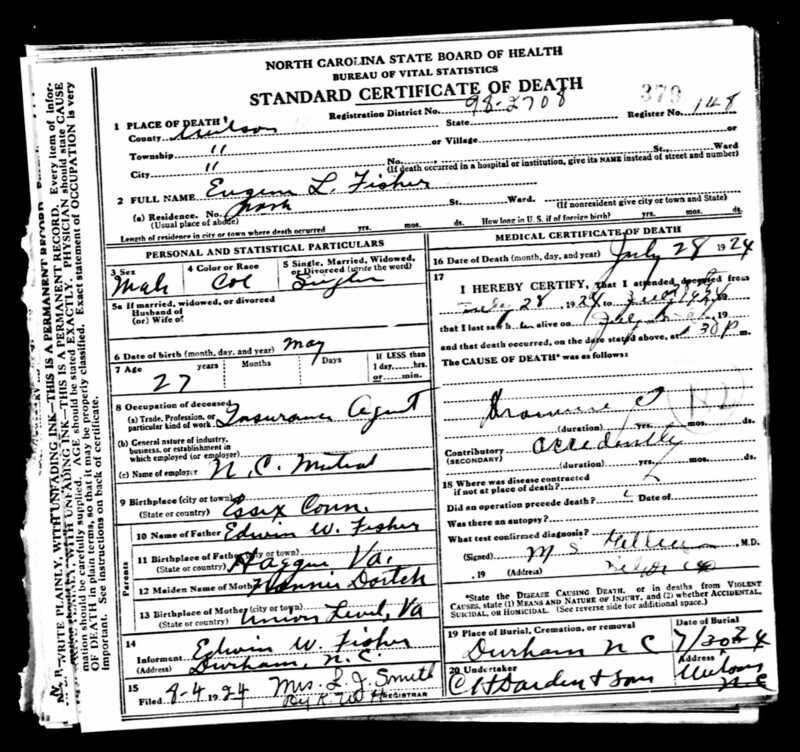 Per his death certificate,he was born 3 August 1904 in Wilson to Ed Mitchell and Frances Simms; was single; lived at 610 Manchester Street; worked as a shoeshiner; and “drowned while in the act of swimming accidentally.” Informant was Millie Simms. Be it remembered that on the 22nd day of April 1872 I, H.W. Peel one of the Coroners of said County, attended by a Jury of good and lawful men, viz J.W. Crowell, John L. Baley, Elijah Williams, M.G. Trubuthan, J.W. Fryar, W.D. Farmer, B.J. Cogins. R.S. Wells. Jas. W. Taylor, Henry Dixon, W.H. Cobb, William A. Farmer by me summoned for that purpose according to law after being by me duly sworn and impaneled at Farmer Mill Pond in the County aforesaid did hold an inquest over the dead body of Joseph Perry, col and after inquiring into the facts & circumstances of the death of deceased from a view of the corpse and all the testimony to be procured the Jury find as follow that is to say that the deceased came to his death by accidental drowning. /s/ J.W Crowell, Foreman, L. Baley, W.A. Farmer, Wm. D, Farmer, Henry Dixon Jnr., Elijah Williams, B.J. Coggins, M.G. Trevathan, W.H. Cobb, J.W. Friar, R.S. Wells, J.W. Taylor. James G. Cobb being duly sworned says that on Sunday April 21 1872 himself, Ralph Faison & Bynum Arrington Crisp McNair together with Joseph Perry Deceased were at Mill Pond of W.D. Farmer in County of Wilson state of North Carolina & Proposing to go in Washing or bathing. There upon said Cobb & Ralph Faison proceeded to swim a distance of seventy five yds or thereabout & parties consisting of the other witnesses Bynum Arrington Crisp McNair & Jos Perry deceased were left on & near the shore, upon being called by Bynum Arrington he the said Cobb looked back & saw Joseph Perry deceased appearantly struggling & sinking under twice after he the said Cobb saw him. Further stating that aid Perry threatened to swim as far as any of the party & that he saw no person or persons interfere with deceased in any way by which he could have been encouraged to go beyond his depth in water. The other witnesses above being duly sworn testified to the facts as above and all agree in the matter that Joe Perry was alone & no person interfered with him while in the water. /s/ James (X) G. Cobb, Ralph (X) Faison, Bynum (X) Arrington, Crisp (X) McNair. Joseph Perry – probably, in the 1860 census of Gardners township, Wilson County: Kinchen Locust, 8, and Joseph Perry, 6, in the household of Henry Dixon, 76, a white farmer. Kinchen was black; Joseph, mulatto. Also, in the 1870 census of Joyners township, Wilson County: Joseph Perry, 15, farm laborer, living in the household of Eveline Evans, 52. Eveline and her children are described as white; Joseph, as mulatto. Bynum Arrington – in the 1870 census of Joyners township, Wilson County: farm laborer Haywood Arrington, 45; wife Louisa, 35; and children Bynum, 16, Ervin, 11, and Anthoney, 8. William Barnett — in the 1870 census of Cross Roads township, Wilson County, Virginia-born farm laborer William Barnett, 21, and wife Rosa, 30. Working on the railroad, drowned on the river. Wilson Advance, 16 February 1883. When construction resumed after the Civil War, the state of North Carolina leased thousands of African-American convicts — many sentenced for trivial crimes — to the Western North Carolina Rail Road Company to perform the dirty, dangerous work of grading, laying rail and excavating tunnels. Hundreds died, including Jerry Smith. The W.N.C.R.R. crosses the Tuckaseegee River, which flows entirely in North Carolina, several times between Bushnell and Almond, North Carolina. The Wilson Collegiate Institute, a private school for boys, opened in 1872 and operated for about 20 years.